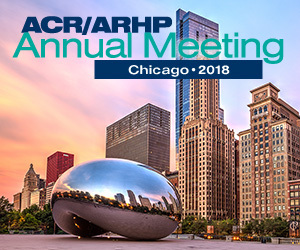 Background/Purpose: The American College of Rheumatology (ACR) annual meeting is the premier rheumatology research and education event of the year. The ACR adopted the use of social networks to spread medical knowledge. Twitter is a popular social network site with hundreds of millions of users and over 500 million Tweets being sent each day, there is a great opportunity for ideas to reach a global audience of new and existing professionals and patients. The ACR has specifically used and encouraged the use of twitter for such purpose and to promote its events and disseminate news and educational tweets from the annual meeting. In this study, we aim to analyze the use of twitter at the 2016 ACR annual meeting. Methods: The Sympular Signals, a specialized healthcare social media analytics platform was used to analyse the hashtag #ACR16, the official hashtag of the ACR 2016 meeting. The analysis was conducted on tweets during the meeting days November 11th-16th of 2016. The number of tweets, participants, impressions, average tweets per hour and average tweets per participant was determined. Advanced search on Twitter was also conducted using the hashtag #ACR16 with timeframe between November 11th-16th. The resulted tweets were sorted by category “top tweets” which are the most popular tweets according to Twitter. The top 50 tweets were categorized by content to scientific, social, administrative, industry promotion, or irrelevant. Results: The 2016 ACR annual meeting had over 16,000 attendees from around the world. The number of people who participated in the hashtag #ACR16 was 3,298 (about 20% of the attendees) sending 16,796 tweets during the meeting days, with an average of 5 tweets per participant and 117 tweets per hour, leaving 50,302 million impressions. The hashtag activity reached a peak of 4146 tweets on the 4th day of the meeting, November 14th. Seventy percent of the top tweets were by physicians, 10% by medical journals, 10% by patient advocate groups, and 10% by non-medical patient advocate individuals. Forty two percent of the top 50 tweets had scientific content ranging from disease progression to treatment options. Whereas 28% had social content such as selfies and group photos to commemorate the event. Irrelevant tweets were mostly appreciation tweets addressed to some of the presenters at the meeting and represented 26%. Surprisingly, only 2% of content was industrial promotions and 2% were administrative tweets. Conclusion: Twitter has facilitated communication between attendees and helped in delivering valuable information to them and to the public efficiently and free of cost. Most of the tweets were posted by physicians and the posts were mostly scientific. A more targeted approach can be implemented to increase tweets generally and scientific posts specifically by attendees, and to encourage industrial companies to tweet about their products. This is a useful and cost-effective way to deliver valuable information and knowledge to a much further audience than just attendees. Disclosure: M. Mohameden, None; V. Malkhasyan, None; B. Alkhairi, None; N. Aljaberi, None; C. Yuvienco, None. Mohameden M, Malkhasyan V, Alkhairi B, Aljaberi N, Yuvienco C. Tweeting the Meeting: Analysis of Twitter Use during the American College of Rheumatology 2016 Annual Meeting [abstract]. Arthritis Rheumatol. 2017; 69 (suppl 10). https://acrabstracts.org/abstract/tweeting-the-meeting-analysis-of-twitter-use-during-the-american-college-of-rheumatology-2016-annual-meeting/. Accessed April 20, 2019.